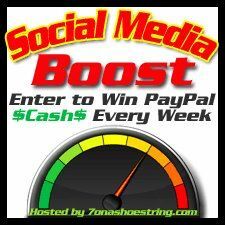 How would you like a chance to win some PayPal cash each week? I have teamed up with a great group of bloggers and we only plan on growing each week. The giveaway starts each Thursday at 12:01 am EST and runs until Tuesday at 12:01 am EST. The winner will be notified on Tuesday and have 48 hours to confirm and then we start all over again! Each week you will have a new task to perform.